Life happens fast. And because of this, we often forget we are steering our own ship. We forget that life is a collection of moments, and that these moments are what truly define us. If we could just learn to place more emphasis on the moment, we could mine more meaning from life. 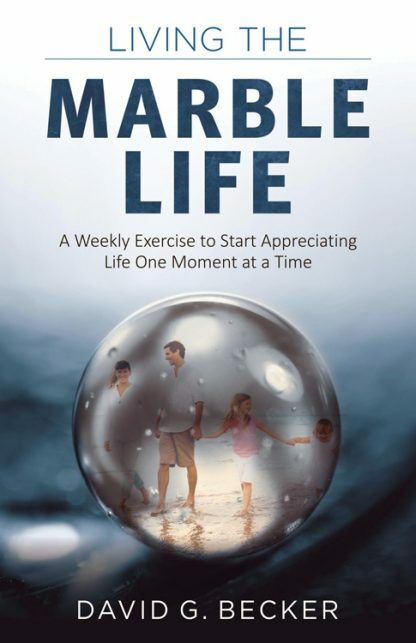 Living the Marble Life will teach you simple yet profound techniques to help you slow down life, pay attention to the here and now, and cherish and enrich each experience to gain greater fulfillment out of each moment. In addition, you will learn mindful exercises that will help you discover the true you harbored deep within. Marble Life was born from a decade-long experiment and has evolved into a daily exercise that will revolutionize your way of living. It is a philosophy, a way of life, a technique, a life tool . . . a Life Appreciation System grounded in the idea that using a single object�in this case, a marble�can help you focus on exactly where you are in life and appreciate each moment for the gift that it is. Through projection channeling, an object as small as a marble can work as a powerful, consistent, visual reminder that will help you readjust the spotlight on what is truly important, rather than repeatedly acting out old habits or behaviors simply because they feel familiar. The tools in Living the Marble Life will show you a new way to appreciate life and the people and the moments in your life. Welcome to Marble Life. Your Life Appreciation System starts today!